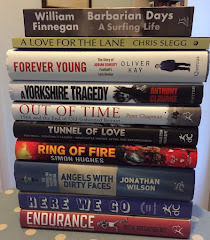 To those familiar with the literary standards normally associated with footballers' autobiographies, it will come as no surprise to learn that the William Hill Sports Book of the Year has yet to find a winner from that genre, even though the most prestigious of all sports book prizes is now in its 25th year. That might be about to change. Among the shortlist for the 2013 award, announced after the field of 17 named in the longlist was reduced to six, is I Am Zlatan Ibrahimovic, the self-told story of one of Europe's most successful strikers. Published in Sweden in 2011, the memoirs of the multi-decorated striker -- currently with Paris St Germain after a career that has brought him league titles in Italy, the Netherlands and Spain as well as France -- sold 500,000 copies in hardback within two months and subsequently achieved worldwide sales running into millions. Ibrahimovic is not short of fans -- the rapture that greeted his four goals for Sweden against England in a friendly last year was proof of that -- but it was not so much his fame but the unvarnished nature of his story that captured the public imagination. Now published in English by Penguin, it has plainly had a similar effect on the William Hill judges. In essence, it is a rags-to-riches story of a boy from Rosengard, a deprived area of Malmo populated largely by immigrants, whose parents -- a Croatian mother and a Bosnian father -- drank and fought and split up when he was only two and left him at the mercy of ghetto life, where he clung to football and the possibilities it offered as a means of surviving. He charts his career in the professional game with the same graphic honesty, revealing the sides of top-level football that tend to be kept secret. With the help of David Lagercrantz, a Swedish journalist and author, Ibrahimovic tells tales that are sensational on one level but on another merely portray football in the raw, with no attempt to spare reputations, or to sanitise the truth. Ibrahimovic is happy to admit that football has been good to him -- he has, after all, achieved much that he dreamt about as a poor immigrant, when he fantasised about marrying a pretty, blonde Swedish girl and living in a calm and ordered Swedish neighbourhood -- but neither does he pretend that the journey to success has been smooth, not least because of his own rebellious nature. Great tips by Predictions365 about football betting tips and France Ligue 1 Predictions and Betting Tips and English Premiur League Predictions and Betting Tips by Today cricket match predicitons and betting tips with IPL Betting tips and Predictions Thanks to write this review about sport betting tips .I really love to get free cbtf and soccer predictions .